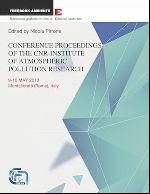 The Institute of Atmospheric Pollution Research of the CNR (Italy) held the Annual Conference on May 2018 in Montelibretti (Rome). The abstracts reported in this volume give an idea of how the Institute has evolved to meet the current challenges in atmospheric pollution research, the range of activities in which the Institute is involved, and demonstrate how these activities combine to produce research and innovation which is pertinent to current scientific questions, policy decisions and eventually the well-being of both the environment and society. The Institute’s involvement over the last ten years in European and International research programmes, its increasing role as a source of information and know-how to inform and advise on policy nationally and internationally is an evidence of the relevance of the Institute as a whole, and the quality and stature of the individuals whose daily efforts make it what it is. Nicola Pirrone has been Institute's Director of the CNR-IIA (http://www.iia.cnr.it" rel="nofollow">http://www.iia.cnr.it) from October 2008 to June 2018. He is currently Research Director at the same institute and Adjunct Professor at the University of Michigan. During the last three decades he has been Principal Investigator of over 50 research projects funded by major European and international funding institutions (i.e., EC, USEPA, Italian Ministries of Research and Environment, World Bank, GEF, UNEP) and currently coordinates one of the leading European Programs on Earth Observation, the ERA-PLANET (http://www.iia.cnr.it" rel="nofollow">http://www.iia.cnr.it) that involves over 35 university and research institutions from 15 European Countries. During the last 25 years he had an active role as expert member/chair/head of Italian delegations in European, International and National programs and was part of European and international Task Forces related to different aspects of Earth Observation, Environmental Research, Environmental Policy development and Evaluation of research strategies in EU and abroad. He is currently the chair of the GEO Flagship "Global Observation System for Mercury  GOS4M" (http://www.iia.cnr.it" rel="nofollow">http://www.iia.cnr.it), the GEO Principal of Italy (http://www.iia.cnr.it" rel="nofollow">http://www.iia.cnr.it), and Chair of the UNEP Global F&T Partnership. In 2017 he was designated by the Presidency of European Union as European Representative in the ad-hoc group on Effectiveness Evaluation of the Minamata Convention.